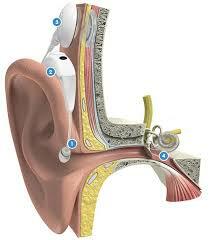 The cochlear implant is a prosthetic device, a part of which is surgically implanted inside the cochlea. Cochlear implants have been found to be beneficial for children and adults with severe to profound hearing loss and steeply sloping hearing loss who do not benefit adequately with hearing aids but have an intact auditory nerve. 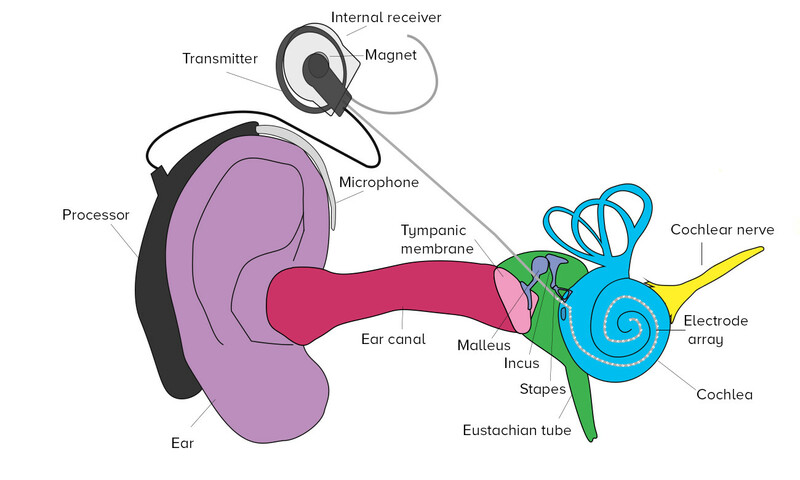 While a hearing aid provides amplified sound energy to the ear, the cochlear implant directly provides electrical stimulation to the nerve endings in the cochlea. A Cochlear implant has an externally worn device which includes the microphone, speech processor and transmitting coil and an internal device which is surgically implanted in the skull and cochlea. The internal device consists of the receiver stimulator package and the electrodes. 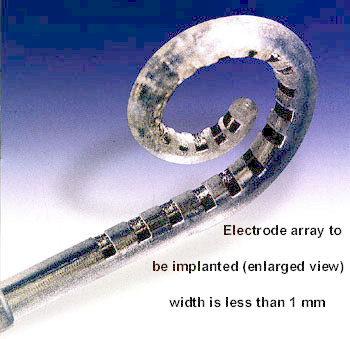 Given below is a picture of a Nucleus cochlear implant device. Sound is picked up by a microphone placed on the ear. The microphone converts the sound into electrical energy. This electrical signal is transmitted through a cable to the speech processor. The speech processor may be a body worn device or a ear level device. It analyses and digitises the sound into coded signals. This coding is done by the processor depending on how it is programmed. The speech processor decides how much current is to be sent into the cochlea so that the wearer will hear the sound. Different types of speech coding strategies are available on speech processors. The coded signal from the speech processor is sent to the transmitting coil worn on the head. This coil is held in place with a magnet. The transmitting coil sends the coded signal across the skin via radio frequency link, to the receiver stimulator package. The receiver- stimulator package is surgically fitted in the mastoid bone of the skull just behind the ear. The receiver stimulator package contains a magnet so that the transmitting coil and receiver are aligned with each other without any direct contact through the skin. Stimulation of the electrode array leads to stimulation of the nerve endings in the cochlea. This results in a sensation of sound. How does one evaluate the need for an implant? It is only after all these detailed assessments that candidacy can be determined. If the child or adult is deriving adequate benefit through hearing aids, a cochlear implant would not be necessary. It is obvious that for a cochlear implant program to be successful a team of professionals is required. The team includes audiologists and speech language pathologists, the ENT surgeon, the paediatrician in case of children, the neurologist, the special educator, the psychologist and the social worker. Other professionals may be called to give their inputs if required for a particular patient. The surgery for the cochlear implant may take about 2 and a half hours. The surgeon makes an incision behind the pinna and then surgically implants the electrodes inside the cochlea and the receiver-stimulator package in the mastoid bone behind the ear. The patient may have to remain in hospital for a day or two. After the surgery, one has to wait for the scar to heal. This period is approximately 2 to 3 weeks. During this time, the implantee cannot hear through the implant because the external part is not coupled to it yet. After this healing period is over, the implant and processor are programmed or mapped for the first time. This is called the ‘switch on’. During the switch on, the speech processor of the patient is connected to a computer which has the mapping software. The processor is worn by the patient and the transmitting coil is place on the head so that it can communicate with the internal device. Mapping is done by an audiologist to decide how much current is required for the person to hear sounds well without causing any discomfort. After the mapping is complete, the device is switched on. The maps can be stored in locations on the speech processor and upgraded at each subsequent mapping session. Initially in the first few months, the person will need frequent sessions of mapping to improve the signal which is being sent to the implant. It is also important to continue with training to improve listening skills. The roles of the special educator and the speech – language pathologist are very important in rehabilitation. While the cochlear implant helps persons with profound loss to hear soft sounds, the user still needs to be trained to understand the auditory signal. In case of children, the focus is on developing listening skills as a means to developing age appropriate speech and language skills. Cochlear implants do not make the hearing normal. Hence post-implant rehabilitation is very important for successful outcomes. Outcomes also depend on many other factors such as the age at implantation, pre-implant hearing and speech- language status and motivation of the implantee and family.